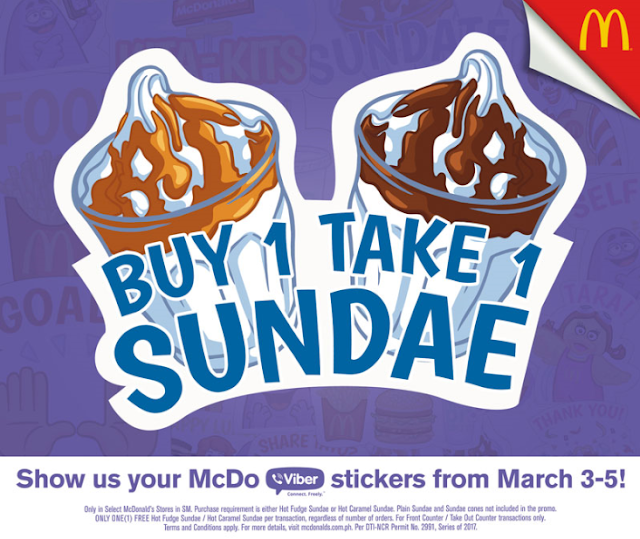 The Food Alphabet and More: Buy 1 Take 1 Sundae at McDonald's!!!! Head on to these participating SM Malls to avail of this cool treat: SM Aura, SM Bacoor, SM Bacolod, SM Baguio, SM Baliwag, SM Makati, SM BF Paranaque, SM Bicutan, SM Cagayan de Oro, SM Calamba, SM Batangas, SM Mall of Asia, SM Manila, SM Marikina, SM Marilao, SM Masinag, SM Megamall, SM Muntinlupa, SM Naga, SM North EDSA, SM Novaliches, SM Cebu, SM Clark, SM Dasmarinas, SM Davao, SM Fairview, SM Iloilo, SM Lipa, SM Lucena, SM Taytay, SM Cauayan, SM Rosales, SM Rosario, SM San Lazaro, SM San Pablo, SM Santa Rosa, SM Seaside Cebu, SM Southmall, SM Sta. Mesa, SM Sucat, and SM Pampanga, SM Gensan, SM Valenzuela, SM San Jose, SM Trece, and SM Cabanatuan.